As the regional train to Grenanda sped through small towns and past kilometers of olive tress, I read my lonely planet guide and figured out that I needed to take the 33 bus to the center of town. 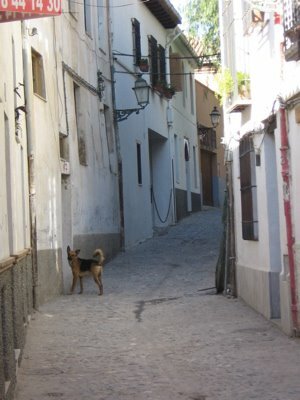 When I got off the bus I followed the windy streets toward the hostal and my phone rang with an unidentified number. I plopped down my overstuffed backpack, looked over the sierra nevadas and flipped the phone open. It was a representative from an insurance company! He needed my consent for some insurance transaction that my grandmother is schemeing up. I spoke to him for about 2 minutes, hung up, picked up my bag and then found the hostal. Or did I, I walked in, put down my bag again, and sat down in a chair to check in. “This is the funky hostal” she said, “You’re looking for Oasis, right?” I was, indeed, looking for the Oasis, so she pointed me toward the other side of the town, “I guess they haven’t updated this edition either” she sighed, as she pointed toward my guide book. I crossed town, stepped in dogshit, but eventually found my way past 10s of Islamic trinket vendors to the Oasis. I checked in with the friendly proprietoy, and after I put my backpack down in the 8 bed bunk room, I went down to the kitchen and made some mint tea and check my email. There were a coupla guys playing mandolin and hand drum. I was anti-social for the first few hours. That night, I went out for Grenada Tapas, which is nice because every time you order a drink, they ask you what you want to eat. In Madrid, sometimes you get some free nuts, but here it’s a bit more generous. I had a ham and cheese crepe, meatballs, croquettes and some jamon. I like food. Later that night I remembered how funny it is to share a room with 7 others,. You learn little eccentric thoings about people, like the British guy yelling at his mother in his sleep, and the Belguin guy taking 35 minute showers. 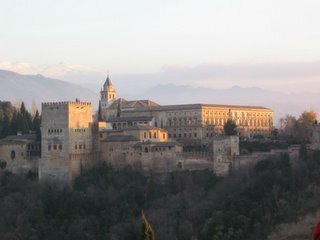 I slept well, however, and the next day took a long walk through the old city, getting lost in the windy streets of the Islamic quarter and taking a nap at the highpoint of the city that faces Alhambra. Then I woke up and finished reading A Confederacy of Dunces. Anyway, sorry for the tangent, I finished that book, returned to the hostal and met Gunnar, a nice Norwegian fellow who I ended up traveling with to Cordoba 2 days later. 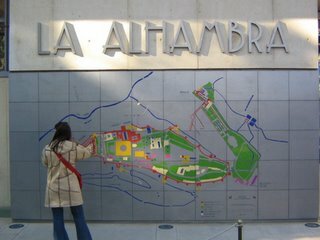 The next day I went to Alhambra a fortress/garden/palace that housed many years of Islamic rulers in souther spain. I went there with Masago, a Finnish/Japanese fellow who spoke Spanish worse than I, (but we spoke it nonetheless) and we walked through the palace and then ate bread, cheese, salami and chocolate on the patio. That night the hostal hosted a 3 course dinner, and I ate and then drank beer late into the night with a bunch of guys from the hostal. Next morening I woke up with a sore throat and went to Cordoba. When I got back to Madrid, I went directly to Carolyn’s home and picked up Maria’s guitar (did I mentioan that I wrote 3 songs here in Spain, all in the course of 2 weeks. . . Inspiration struck at one little moment) I hurried over to Maria and Maria’s casa to celelbrate complianos feliz, for little Maria. Maria Jesus cooked amazing leg of lamb with a side dish of couscous and I did my best to try and tell the family (Maria’s mother sister and friend were all there as well) about my trip, but I felt inadequate in my ability to understand and express. They were amazing hosts while in spain. Letting me stay for 3 weeks, and then always providing warm meals and supportive words when I needed them. Now I’m back in a public transportationless NY. Haven’t had any moments to really reflect on the return from my little 2 2/12 month dream. It’s nice to see family and Suko.